One solitary Transformer has taken over one of Seoul's oldest buildings. This bizarre-looking building can become a movie theater, a fashion exhibition, a live performance space, and maybe a killer robot. Prada's shape-shifting "Transformer" can take on different configurations and uses, depending on which side it's placed on. Designed by Rem Koolhaas' legendary Office for Metropolitan Architecture, the 160-ton structure can be lifted and rotated in just one hour to create a different shape, including a totally different inner space. It's wrapped in a highly elastic polyvinyl chloride membrane, which was sprayed on as a liquid. 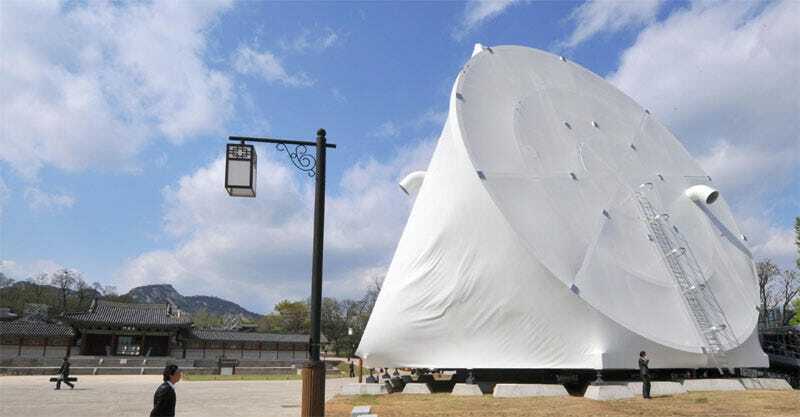 Stationed next to the 16th century Gyeonghui Palace, the building is designed to be easily rotated in a tight space, without damaging any nearby buildings. Each side has three openings, which connect to a series of air-conditioning vents.